I'm not really even sure where to begin, as the last 60 hours of my life are a huge blur. In this moment, I think it was the most incredible thing I've ever done in my life, and also the worst idea I've ever had! Total Money Raised So Far: $1877 (donations still accepted until June 30). My friends and family helped me raise a total of $400 for my team! Thanks everyone who donated!!! sections of a few more. Alright, so here's the long version...will try to keep it limited to the basics. Times are extremely approximate as I lost all sense of time shortly after starting. I was really nervous before the event began. I kinda felt a big "What did I get myself into?" There was a lot of rain forecasted and I wasn't really looking forward to walking 62 miles and not sleeping for almost 2 full days. Here are my teammates thoughts just before the finish...I accidentally cut of Kory's second definitive "Let's go" at the end...so just imagine a definitive end! heavier rain, sometimes lighter, but pretty much constant. 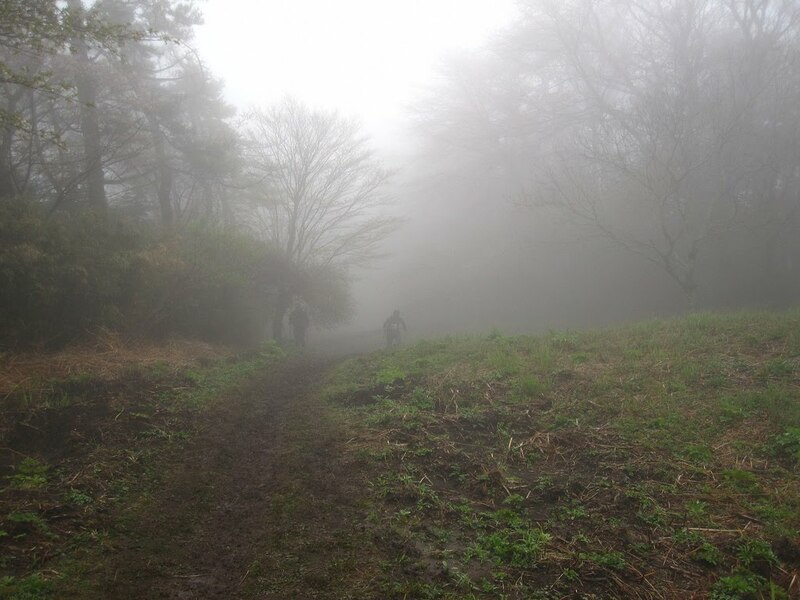 Photo by CindiRocks, another hiker from Shizuoka. Click on the picture to see her other pics on Flickr. The rain continued (basically this is going to be a theme for awhile), but the course is flat and easy, but only easy in comparison because we had already walked 18km. I think a few of the guys had a rough time with this part because it's easy to get bored with all the flatness. It was a high point for me however. It's easy to have good conversation during these parts since you don't have to watch your footing and many places are wide enough that you don't have to walk single file. CP2-3 is only 5.5km and beautiful. It goes around a pond and along the Old Tokaido road where people would travel from Tokyo to Kyoto and Osaka. We passed through this section with a breeze and got some more food (still no place to sit) at CP3. The next section is still flat, but the longest section yet. It's 12.5 km around a beautiful lake...that is less than exciting in the rain and fog. At this point I was excited to make it to CP4 because I knew all of our friends would be there with food. Also, I really wanted to get to CP4 before dark, and we made it without having to use our headlamps. And I also knew that I could change some clothes at CP4 and get rid of some of the weight in my backpack and give it to support crew. Start to Checkpoint 4 took us approximately 10 hours. Checkpoint 4 was a great pick me up! We arrived basically exactly at our estimated time, which was surprising to us. Most of our friends had made it (they had to work on Friday, so some couldn't arrive 'til later) and had brought us changes of clothes and an incredible spread of food. I had like 3 sandwiches, veggies and cheese dip, some chocolate and snacks, my first Red Bull energy drink, and probably more that I can't remember. We stayed here for a little over 2 hours, changed clothes, got stretched by some "professional" volunteers, put our muddy rain gear back on and headed out rejuvenated. So this is quite a long section. The first 6 km is on the road, not so difficult. It was still raining and cold, and in the dark. We made it to the trail and there were a few people around and we were hoping it wouldn't be a big line of people again...it was with good reason. I seriously cannot describe it as anything other than 12 km of hell. The trail was sloppy, slippery, slimy mud with rain still coming down (and some people have said hail...but I think we maybe finished before this or completely blocked it out!). We probably couldn't have gone too much faster even if there wasn't a big crowd of people. The mud was ankle deep in most places, deeper in some places, but not really less than ankle deep the entire way. I had to use my hands a lot to brace myself and they got cut up from the plants on the ground. The way down was just as bad...pretty much it was like skiing in the mud -- in many places we just had to let our feet slide down the mountain and be really careful not to get injured. I think we probably all took at least one fall in this section. We also got lost for a bit because of the fog and darkness. A Japanese team I think had followed us and yelled up ahead to ask if we were sure we were on the trail. We weren't sure and didn't recognize anything, so we turned back and got back on the trail by shouting down the mountain at some others. 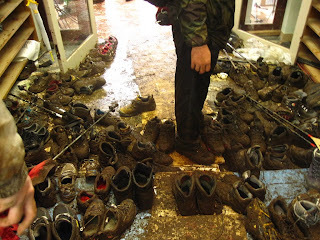 which shoes were yours as all distinguishing features were covered in mud. Photo by CindiRocks, another hiker from Shizuoka. Because this part was so ridiculous, we decided not to continue on in the dark and rain. We changed our rest plan and stayed at CP 5 for about 2 hours until sunrise. 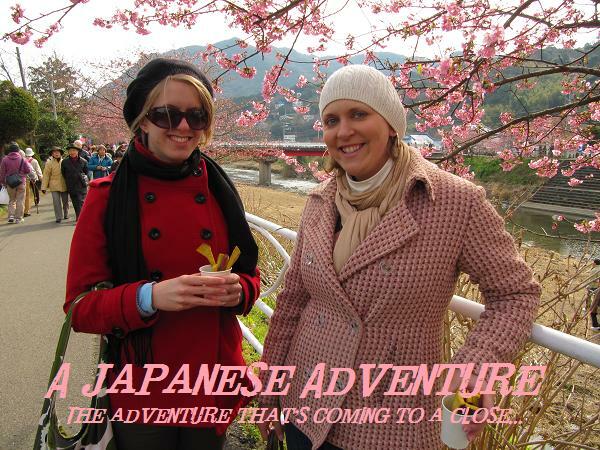 We ate some food, tried unsuccessfully to get some sleep, and changed some clothes. We headed out in the morning at around 6am. This section usually takes us 2 hours. Our muscles were tight and we were tired, so we took it easy and finished in like 2 hours and 20 minutes or 30 minutes. Took a short 30 minute rest at CP6 for some more food. So we arrived here at maybe...8:30 am and left around 9 am after Day 1. I don't remember much from this section. I think our pain started to become real after 45km. Of course things start hurting before then, but we had done many practice hikes around 40km, so we understood the pain until this point. It was discouraging that we still hadn't even reached the halfway point, and hadn't climbed even half the mountains yet. I think I was mentally numb in this section. This section has one pretty challenging mountain. I'm the slowest climber on my team, so often in any longer climbing sections I take the lead so that I can go at my pace and we can continually climb together instead of me falling back, or us having to stop for breaks. On our first practice hike of this section, I had one of my lowest of the low points, so I always dread this mountain. In the daylight, it wasn't so bad. Because I expected it to be bad, it actually ended up being much easier than I thought. Of course challenging, it's a big mountain for god's sake. But so much of it is mental and I was in a pretty okay place. Also it was daylight and this section wasn't TOO muddy, so we were able to make good time back down the mountain. We try to jog down the mountains for less impact on our knees. It also helps our time of course and honestly feels like it takes less effort. And it makes you feel good that you're making good time. I felt good after the downhill. It wasn't as muddy and it was daylight, so we could get down pretty fast. We also passed the halfway point in this section which was a little bit of a boost...but then we had a lot more kilometers to go before reaching the next resting place. After that however, was my lowest point of all. There is about 5 km of road walking at the end of this section, and it's a really boring walk with nothing to look at. I checked out emotionally. My pain was real. My left hip flexor was screaming with each step and my right calf felt rock hard, like the muscle wasn't even flexing as I walked. 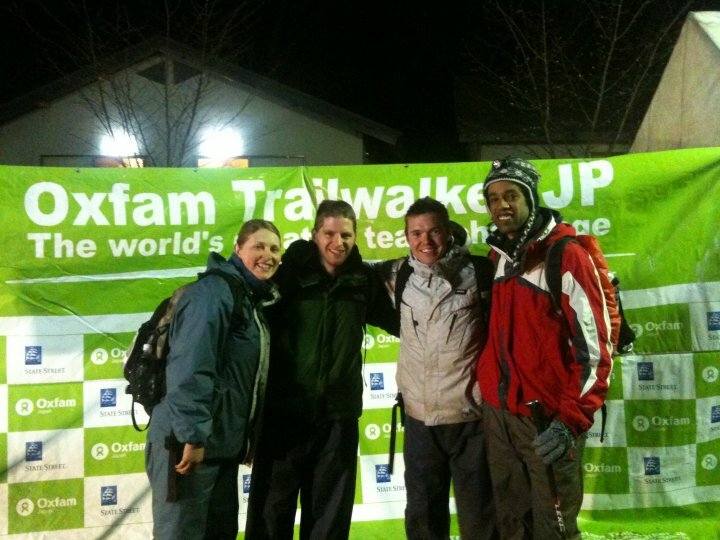 I hadn't had any REAL sleep in well over 24 hours and I had thoughts of dropping out at CP7. I knew that I didn't want to, but I just didn't think I would be able to take my body up 3 more mountains (which is actually more like 4-5 mountains I realized later at the point of no return). In the last 2km of that section, I put in my headphones and played every inspirational song I had on my iPod that I thought would give me what I needed to continue. I felt better, but as soon as I reached the checkpoint, I realized that I couldn't really talk to anyone without starting to cry. I couldn't answer even a simple "How are you doing?" or "Can I get you anything?" without my voice cracking. I ate some food and went into the shower. One of my bags had gotten lost, so I had no clean socks or underwear, didn't have the towel I had packed for this checkpoint, and only had one clean undershirt to put on. I took a shower and soaked in the baths, letting some jets massage my calves and thighs and back. I blow dried my socks and sports bra and got stretched out. I thought I was doing better emotionally, but when around people again, I just couldn't not cry. This was the checkpoint that I told myself "If you make it to CP7, you have to finish. It's only 20 more kilometers after doing 80." I knew I had to go on, and that if I could complete 80km, that I could do 20 more. And I knew that basically after leaving CP7, that it's a point of no return. CP8 is the final checkpoint and it's basically on the side of a road between two mountains, so you really can't quit there. It's also the mark where there is only 6.5 left in the entire thing, so it would be really lame to quit there. So I knew I had to do it. The guys were ready to go, and Kory asked me if I was ready to go at 3:15pm, which was 20 minutes later. I couldn't respond with more than a "no." I was still unable to talk without crying and my calf still felt like a rock. Deep down, I knew that it was best if we got out and were able to climb the next mountain, one of the toughest of all in the daylight. I knew it. But my body didn't. We left anyway. I didn't take the time to tape my feet and decided that blisters at that point weren't going to make a difference. Checkpoint 7-Finish: Officially 3 mountains...Technically 4+, 20.5 km (12.8 miles), Sunshine to start and a little light rain at night. Very cold. April 24 afternoon and evening. I was pretty down at the beginning of this, as I just told you my emotional and physical state when leaving CP7. But about 10 minutes into the first mountain, I realized that I was going to finish. This is the most difficult section of the course, not only because you've already walked 80 km and climbed 4 mountains, but it truly has the steepest mountains of the course, and has 4 mountains packed into that "short" 20km. I had a few low points in the section because of the pain and also I was a little nauseous for awhile I think from lack of sleep, some food that I ate, and pure exhaustion. But overall what I remember about this section was just putting one foot in front of the other with purpose. When you're that close to the goal, each step has much more meaning than in the beginning when you can't even fathom the finish line. We took the mountains slow and steady with me leading. The light turned into darkness and we continued on and up some more steep mountains. This section is tough. Really tough. There is a mountain with a bunch of never-ending stairs, a section where you have to pull yourself up some stairs with a rope, sections with no stairs or rope that are just steep and long. In many parts you can't see the top of the mountain. In many others you see what you think is the top, only to go 100 feet and have another steep incline start. I tried to not look too far ahead and focus on one step at a time. As cheesy as it sounds, all I could think about over and over again was about the enormity of what I was about to accomplish. Even now as I type this, it overcomes me with emotion. I have never and probably never again will push my body as hard as I did in those 39 hours. On the last mountain, about half way up and only about 3 kilometers to go, we turned around and there was the enormous shadow of snowcapped Mt. Fuji over Lake Yamanaka. The sky was clear, the stars were out, and the moon was bright. I continued in my reverie of accomplishing something so great. We made it up and down the last mountain and continued quickly along the road for a few more kilometers to the finish line. We were all in an unbelievable amount of pain, but we still moved as quickly as we could, knowing we were so close to the finish. We crossed the finish line in 38 hours and 39 minutes at close to midnight on Saturday night. There were still some people around to welcome us in. Our support crew and fellow teachers from other support crews came to welcome us in with excitement. We smiled for lots of pictures, got certificates, got hugs and smiles. I was so glad to be finished, yet felt like the smile on my face was work. I'm so thankful for my amazing teammates, Kory, Linton and John. I feel like it was truly a team effort and I'm so glad we could complete this challenge together. I've been saying it all along, but I think we have great team chemistry and I honestly don't know if I would have made it with anyone else. Thanks for pushing me when I needed it, being patient when I was slower than you, and for keeping me awake through long hours with dookie jokes and other unmentionables. Can't believe we finally made it! We also had amazing support crew, which I knew we wouldn't have made it through without. At each checkpoint they essentially became our slaves, bringing us this or that, making multiple trips to the car to get the things we wanted, carrying around our changes of clothes and gear, rubbing feet and shoulders, giving us food, and waiting around for hours at different checkpoints for us to show up. I'm so grateful for the work that they did to help us along the way and they deserve a lot of credit for what they did. It wasn't as hard as climbing 8 mountains, but they also went without sleep, spent time preparing and making food, dealt with our crabbiness and exhaustion -- and did it all with a happy face. Thanks for helping us through. You guys are the amazing! Yaaaay! You guys are amazing. I'm so glad you finished in one piece. That's a huge victory!